The material for this paper came from Anita Trueman Pickett’s personal diaries and unpublished autobiography, “Grandmanita’s Youth”, which were generously shared with me by her family members. I am grateful to her daughters — the late Estelle Pickett Coggins and the late Laurel Pickett Stackpole — and to her granddaughters, Carol Coggins Powell, Debbie Stackpole Merritt and the late Anita Stackpole Dougan, for their generosity, hospitality and encouragement. My thanks go also to ATP’s grandson, John Pickett, who, with his wife, Judy, have extended an invitation to study the diaries in their keeping for further research toward the full book I hope to write about Anita. I can’t leave out David Stackpole, who first brought Anita Trueman Pickett, his grandmother, to our fellowship in Ulster County. My brief acquaintance in 1959-60 with the gracious but modest lady set the stage for my consuming desire to share her amazing life story with others. My gratitude to David, who became a personal friend in those long-ago years, is also for his inadvertent launching of my lifelong pursuit of folk music as a career and passion—a fact unknown to him for nearly 30 years, until the research on his grandmother led to re— establishing contact. And to the many friends and acquaintances who have kept encouraging me through long periods of “silence,” to those enthusiastic participants in the three staged readings about ATP at our fellowship, and, especially, to those who have said, when my courage faltered, “You CAN and you MUST write Anita’s story,” I bless you and promise you a longer telling of her story. I have included some quotes from assorted newspaper clippings, from Harold Pickett’s diary, and some facts gleaned from interviews with family members. How Luke Discovered Christmas, published by Beacon Press, Boston, in 1950. These comments reflected the turn-of-the-century public’s opinion of the young woman, Anita Trueman, then in her late teens and early twenties. At an uncommonly early age, she was an established and respected public speaker, poet, author, ardent Single Tax advocate, and preacher of “Free Thought” philosophy. She was a protege of the poets Edwin Markham and Ella Wheeler Wilcox, of Swami Abhedananda (one of the founders of the Vedanta movement in America), and of the world-famed naturalist and author, John Burroughs. We are fortunate to have her own words recording this amazing lifeboth in diaries and in an unpublished autobiography, written for her grandchildren upon retiring to her family’s home in Kingston, New York. Anita Trueman was a woman far ahead of her time in her independence and feminism, yet she was a product of her time. She found society’s attitudes toward women to be a constant source of frustration and conflict. Her struggle was ongoing: between calling and kinder, between career and kitchen, between the dream and reality. She resisted marriage until her late twenties, knowing intuitively that it would present these conflicts. Yet she yearned so desperately for love and family that she eagerly embraced the opportunity for both when presented in the person of Harold Pickett, a fellow divinity student at Meadville Theological School in Pennsylvania. For that family life she risked the circumscription that she feared, and which, indeed, marriage and children proved to be for her. Anita loved her family devotedly, yet her diary was the friend who heard her cries of the battles she continually waged in the conflict between the domestic responsibilities to those dear ones and the role she felt she was put on this earth to fill: spiritual leader. Never a line of it was written… [about].. .that type of woman the world so little understands. …She is the sacrifice needed to bridge over one era to another in the world’s history. When the new order is established, our granddaughters ought to have some record of the revolution which brought them liberty.. ..What is the woman of the future to do with the woman of the past? We are the builders of the world, yet we must use the material at hand in its construction…. I know the world’s need of great, free souls, and I will play that part, but I am determined to live the sweetness of a wholesome womanhood as well. Here, then, is the story of a truly singular woman and her spiritual journey, told mostly in her own words. When Annie Trueman (later to be called Anita) was born on May 17, 1881, to Fanny and William (Willie) Trueman in Cleveland, Ohio, the attending physician presented the new mother with a fragrant bunch of lilies-of-the-valley. For as long as she lived, Fanny always sent a box of these blooms to her daughter on her birthday. Thus the first step in Anita’s spiritual journey was undertaken with these English Quakers. For a time, the Truemans lived next door to a “wicked Unitarian Church.” It would be many years before her spiritual path led her to Unitarianism and her own ordination as a minister in that denomination. During one of William Trueman’s several trips back to the United States while working for the Lancaster Company, makers of fine photographic apparatus, he embraced the ideas of the noted agnostic Col. Robert Ingersoll. For that he was formally disowned by the Plymouth Brethren. In the fall, her mother insisted on taking Anita’s place in the shop and sending her to high school. While her mother worked in the shop, Anita also became the caretaker for her younger sister, Gertrude, born prematurely and with spinal anomalies that made her a semi-invalid (the only one of three siblings to survive). Anita’s several published books, her long and illustrious career as a lecturer, and her years in the pulpit of the Unitarian Church might later serve to contradict that prediction, but, indeed, her finest efforts were always unscripted public presentations (whether lectures or sermons). Eye-strain would always be a problem for her, and perhaps was a contributing factor in her ability to speak so excitingly and well without a script. During this time, Anita rebelled against the educational process to which she was subjected in the Brooklyn school–”accumulating dates and records, without much reference to their human significance…just getting the pupils through the examinations.. .and [implementing] discipline devoted to keeping the building clean and orderly, and preventing the girls from having anything to do with the students in the Boys’ High School, a few blocks away.” In her efforts to promote the theory that education should prepare students for a destiny of transforming the world, and to unfold their potentialities through training in the art of thinking, she was squelched by school authorities. .to feel the vital force of divinity within us, and to use it creatively. He taught us to feel at home in the boundless universe, ready to face our own problems confidently. He made us feel sure that Truth, if served by courageous souls, can recreate the chaotic world into the Kingdom of Heaven. Mysticism had broken out in many forms during that decade. Swami Vivekananda had captured the Parliament of Religions at the World’s Fair in 1892. Psychic research had become a dignified occupation. So it was not surprising that I spoke with authority, and commanded a hearing. Although his ideas were contrary to the teachings of the accepted political economy of the time, George’s books sold in the millions, and his followers loyally advanced his theories for decades. Our city was to be incorporated as a Borough in the new Municipality, and a large proportion of New Yorkers lived in Brooklyn, so the Campaign was coming to our very door. My father had been given charge of the Greenpoint sector with his shop as headquarters. He wanted me to write a campaign poem. That night I wrote ‘The Advance of the People.’ We had become ardent Single Taxers….We had read Progress and Poverty with delight in its clarity and completeness. Although my father was not yet a citizen and I was a minor female, we swung into the campaign with enthusiasm. We knew there was small chance of electing our candidate, but we shared his feeling that here was a wonderful chance for political education….Single Taxers had gathered from all over the country, paying their own expenses for the privilege of sharing in this campaign. We all rejoiced in this chance to preach Henry George’s gospel of equal opportunity to all, full reward to craftsman or artist in the possession of the fruits of his effort, and ample support for community activities and improvements, through a single tax on land values. Anita adds that she recited her poem and gave impromptu talks at the street meetings. She felt the joy of martyrdom when some women in the crowd called her a “bold hussy,” and she enjoyed the audible admiration of her new red plush jacket and matching tam with three small upright ostrich plumes, “Prince o’ Wales style.” Her teachers, however, took a dim view of these activities, especially since, before the campaign, she had held one of the highest averages ever recorded in the Brooklyn Girls’ High School. Their pleading to “keep out of politics” fell on deaf ears. To Anita, the campaign was not politics but reform and, as such, commanded her loyalty. Then a great power seemed to rise within me, and I took the floor. ‘This is what Henry George would say to you if he could speak,’ I began, and went on passionately to urge them to carry on the work. ft was just what the others had been trying to say, but they were older and more weary. My eager dedication of my own youth seemed to hearten them. When I sat down, one of them took from a bookshelf a copy of Progress and Poverty and read the closing pages, one of the greatest sermons ever penned. Instantly that cosmic sense which I had been cultivating in my meditations responded to the picture. Yes! Even this water that tumbles out of the faucet, even the dirty water I pour down the sink, is part of an endless fluid movement of all matter. Silver clouds in the summer sun are part of the circle. Lines of blank verse were dancing five-footed across my imagination as I went back to my scrubbing and finished the task in an exalted dream. Some of its figures were taken from the Bible story of Creation.., but the Vision behind the poem was more cosmic than any Scriptures. Through the years it has remained constant with me. All religious and spiritual movements I have since encountered seem to me to serve that one central truth… .Later I tried to embody my Vision in a geometrical diagram, and built this into a story called ‘Ruth’s Idea’…it serves to record the philosophy which I had shaped for myself at sixteen. As I reflect on it from the vantage of my 78th year, I am well satisfied that it was a good philosophy to live and teach. It has made my whole life fascinating, and enhanced its precious moments. It has carried me through periods of tragedy, and it stands by me in these days when the physical organism is losing its resiliency. Having shared in the creative life of my universe, having drifted through periods of weakness and pain, I know the meaning of Life’s great rhythms, and flow with them toward the ultimate unity. The Anthony Company, for whom William Trueman had been doing repairs and experimental work in his Brooklyn shop, now sent him to manage their New Haven factory. The Trueman home became a center of philosophical and economic discussion. The Single Tax Club that they organized became a real power in New Haven. With her father’s blessing, Anita’s formal schooling ended after her seventeenth birthday. Speaking engagements began to proliferate in New Haven and surrounding towns. William’s natural gift for speaking and writing, echoed in his precocious daughter, blossomed in New Haven, and scarcely a week went by when he did not supply what he called “mental pablum” to the local papers. Anita wrote that her own letters of the period “revealed the strange child that I was, born grown up in certain ways, and destined never to grow up in others.” More importantly, these letters became a means for her to meet many stellar literary figures of the time, as she wrote to them on behalf of the Single Tax movement. luncheon. Mrs. Wilcox was evidently impressed with the young girl, because she invited her to go home with her that night to ‘The Bungalow’ on the rocky shore at Branford, CT. 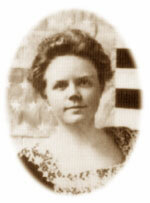 In March of 1899, Anita joined the Single Tax Letter Writing Corps. My first assignment was to write to the author of ‘The Man with the Hoe.’ Although Edwin Markham was a man in his late forties, and had written some delightful poetry while engaged in education, it was this poem which made him a national figure. So I wrote him a four-page letter on my Remington typewriter… It concludes thus: “The Single Tax cause needs writers and poets, men and women of ardent purpose and earnest thought. You should be among their ranks. For want of a great poet, bloody wars have been fought, and ghastly rebellions have watered beautiful countries with blood. Ella Wheeler Wilcox, our Queen of Poesy here in the East stands hand in hand with us. There is work for you to do, and the time is ripe. ”I mailed the letter to Oakland, Cal, and felt that I had done my duty. Little did I realize what rich fruit this seed would bear in my life. Virgil was between us, straining to get out of the window. Papa, holding on to his skirts, quoted for me a quatrain which he had written that morning for the baby. Another public figure who was influential in Anita’s spiritual growth was Swami Abhedananda, the successor of Swami Vivekananda, a disciple of the great saint, Ramakrishna. Swami Vivekananda had been sent to the Parliament of Religions at the World’s Fair in Chicago, in 1892, to represent Hinduism. Both the young poet and the Swami lectured at a summer gathering in Maine. “It was there in the grove of tall pines,” Anita recalled, “that we spent an evening in silence, watching the moon climb the sky, and when we rose to go back to the hotel, Swamiji kissed me. It was just so, with no passion, no desire, no regret. The earth and the heavens had given us of their holiest, and that kiss was the seal of a supreme experience. It left no embarrassment in our relationship. Although Abhedananda never questioned Anita’s call to her work, he wrote her a letter warning of its dangers. Anita lived in the Vedanta house one winter while lecturing for the Liberal Leagues in New York. “It was a great comfort to have that haven of silence, that battery of spiritual force, behind me,” she wrote. “Often I would go into Swamiji’s study for a few moments of devotion with him before taking up the cudgels with my argumentative audience. Swamiji never failed me, but often he laughed with me over the vanity of all this.” Later Abhedananda returned to India to build up the Brotherhood which would become the backbone of Ghandi’s movement. This is the rustic home of John Burroughs, the heaven of birds. I think the birds have religions, and one of them teaches that there is a heaven, where the souls of good birds go, to hold communion with the great Lover of Birds, a place which he has prepared for them. He is away just now, but the cottage, like a nest among the trees, is redolent of the fragrance of his personality. Below me, here in the sunlight, spreads the famous celery patch, its bright green obscuring the rich black earth of the ancient lake-bed. Around the rustic porch, the trees cluster so closely that only scattered glimpses of the landscape are caught between their leaves. But the hills tower high on every side. The noisy world is beyond them. Here only the sighing wind and the songs of birds are heard. Anita met Burroughs unexpectedly at the Post Office on August 17. He had heard about her preaching and was, Anita thought, “a little quizzical, for his own religion was extra mural,” but he invited her to Slabsides the next day. Anita describes one of the many such visits in her diary entry for September 25, 1903. I went up to Slabsides, to seek Mr. Burroughs. He was not there… .1 then made bold to enter the sacred precincts of the Burroughs town place. Passing the stone house, I wandered down to where the study nestles under the crest of the hill, overlooking the Hudson. There I found the dear old man, among a disorderly pile of books and papers. He was delighted to see me, and we had a very amiable conversation. He is evidently deeply interested in me. How fortunate I am to have such friends really care for me… .Returning to Slabsides, we built a fire on the wide hearth. Then we watched the blaze in alternate talk and silence. The poet told the history of his poem “Waiting,” which was written when he was twenty-five. He wrote out a copy of it for me, on his rustic table, while I watched and tended the fire. Yesterday, I went down to West Park, and spent the day with John Burroughs. I found him suffering from an aching head, and very sad. He grows weary of the endless procession of people that pass him by, or press around him, without answering his heart’s cry for comradeship. I cannot tell why he should love me so, but yesterday he seemed to need me very much. I cured his headache for him, and he seemed to find balm for his sorrows in my companionship. He still keeps my books on his table, and talks kindly of me to our mutual friends. The work in Pittsburgh [the Unitarian Church] was the highest fulfillment of my individual mission, and it led me into the security and liberty of the Unitarian ministry. This took me to Meadville [the Unitarian Theological School in Pennsylvania] where I found the perfect love. Why must I wait ‘til the man comes who will share life and the work with me?…Why must I wait for my motherhood until I find the conventional conditions congenially provided? Why must a woman barter her freedom for the privilege of motherhood? I’m growing to scorn conventions for their cruelty to women, and I feel the blood of heroes in my veins. Dear Mother Divine, I trust all things with thee. Am I to be the voice of a new freedom?…for the sake of all unrealized motherhood, for the sake of truth and love and freedom, this thing must be done. I am ready, if it is thy will, dear Mother, to place all in the balance. Make me brave enough to support my convictions, and if the conditions are not complete, grant me patience to wait. I must go back to the work, the work I came into the world to do. There alone is peace, and real self-expression for me. All other associations deny me and fling me back to the path from which I’m so prone to wander. 0 Mother Divine, make thy way plain to me, and guide me on the path. I have been spoiled by the affection of great men. It seems strange to think of loving a man of my own age, one who has not yet faced the battle I have been fighting these ten years. But the Infinite is behind him, and we can be sincere with each other, I believe. It would be glorious to grow on with him, and nourish the greatness in him, and sometimes to be the child I have never expressed, and rest in his love. I think he is brave enough to leave me free in my work, and to support me in it. Help me, dear Mother, to be patient, and if it is to be another renunciation, to be strong. The intimations of thy heart, dear soul, and the deeply implanted yearnings for a man’s love and leading, are now in process of fulfillment. The house beautiful—our home—is being built—daily—hourly is being framed, not by hands, but out of the beautiful self-consecration and surrender of our lives to the divine process of home-making the eternal process to which the Divine Father-Mother calleth us. Blessed be our Togetherness! Inspirational our daily living! Upbuilding, our constant communion! They were married on Easter Sunday, 1908, and spent a summer-long honeymoon tenting on the banks of the Esopus River at her family’s farm in Kingston, NY, while awaiting Harold’s first call to a church. May, 1908 Yesterday was the dear one’s birthday and I gave him myself more fully than ever yet. He called me his birthday gift. It seems truly that I belong to no other soul in the world but him. My love has never been accepted by any other, for no one else has understood me. How many times I have passed the gate of renunciation and fought the great battle of the soul that loves. The nearest souls have not understood and never can. There is no other personal hold for my life in this world save Harold. God grant us many years of companionship. We are both wondrous—loved of many—but still solitary were it not for each other. Mother Divine, I thank thee for all gifts and all trials. I have no need of any earthly thing. My Heaven is in the soul thou has given me for companion. Out of our union shall come a new earth to embody thee. We consecrate our beings to thy will. In Idaho, women have all the privileges of citizenship and the responsibilities…It was indeed a great experience.. .1 hope it will not be long before the citizens of Massachusetts will enact an equal suffrage law that women there may have the right to take their true place in public affairs. After her ordination in 1921, while she was minister in charge at the Rowe church, she was instrumental in starting Rowe Camp and Conference Center. The winters saw her filling the pulpit at Barnard Memorial Church. The rest of the Picketts’ ministerial careers were spent in Massachusetts churches. They held joint pastorates at Medfield and Walpole in 1926-1928. The year 1930 found Harold settled at the Nantucket church, while Anita held the fort at Barnstable and later, Bedford. They served jointly at Dighton and Eastondale in 1942. After his death in 1950, she stayed on until 1952 in the church at Ware, where, since 1947, they had served their last ministry together. The dining room (in 1923-24) is converted into a study, pro tem, and I have been dropping into the professional attitude between jobs: getting out reports, planning calendars, preparing sermon outlines, reading— how I enjoy all this! Some day I promise myself I shall earn more time for this work, but I am very slow about my domestic duties, so that I’m hardly settled at my typewriter before some other call comes and I must leave the work I can do best in order to blunder through the work that I’m not fitted for. Yet I love doing all these domestic things and hope always to have a home to do them in. People persisted in presenting me as the minister’s wife, which is funny. In Peabody they do the same thing, but with more reason. Once when the Tolls and ourselves were in a party, someone remarked about having three ministers along. Another cried, ‘Three? Where are the three ministers?’ and had to be reminded of my right to the title. But the title counts little compared to the privilege of doing the work. What is one to do? Condemnation awaits the minister’s wife who is not an active worker in her husband’s church, but if she is active, she is criticized for ‘running things.’ But woe betide the minister’s wife, who being forbidden a sphere of service in her husband’s church, gives such service outside his parish….how I wish we might have 2 separate but adjacent churches. Harold is attending a meeting of the liberal ministers in Essex County to arrange an association. It is hard not to feel “wrathy” about this being arranged to exclude the two women ministers in the county. I do not think the occasion will pass without some recognition of the error, but it is surprising with what consistency the brethren forget to remember us, even if they do not consciously ignore us., (the host on this occasion) has invited “the men” to the Salem Club where women are not allowed, and I suspect that restriction is a convenient excuse for excluding us…. Twenty years have passed, and how richly they have justified all the dreams of those old days. Was ever woman more blessed than I have been? The love I longed for came to me in the richest possible measure, yet did not separate me from the work for which I was born. The motherhood I craved has been richly fulfilled.., and now I am about to enter on a new phase of family experience, as a grandmother… .this year, Harold and I will probably be alone together, and no newlyweds ever took more joy in each other than we do. After bearing burdens together, sharing our work, facing deep personal problems, enduring great tragedies which almost wrecked our home, we have grown together gloriously…. Harold and I found our togetherness in sharing our work. In domestic and business affairs we can seldom agree. It was the work which brought us together in the first place and it was the work which healed our differences. Harold gave me my motherhood—the supreme thing in my life with its extension into two more generations. He is in those children, grandchildren and great-grandchildren. Upon her death in 1960, she willed her home to the then-new Unitarian Fellowship of Ulster County (flow the Unitarian Universalist Congregation of the Catskills), of which she was a member. a work of art that shall glorify God. and Heritage Society 670 High St.
© 2019, Unitarian Universalist History and Heritage Society. All rights reserved.